I'm going to put an excerpt from The Guardian on here in a second. The Guardian, for those of you that aren't Anglophiles, is sort of the British Isles' intellectual appendix. That is to say, it doesn't seem to serve any positive function; it collects detritus; is dangerous if it ruptures into the body politic; and even though its removal from your life seems to have no deleterious effect, you just leave it there and ignore it unless it gets inflamed. Anyway, we read the The Guardian because we are dying to know whether Bush is Hitler, or Bush is Mussolini; and they are the only ones that cover that waterfront 24/7 to our satisfaction. Personally I lean towards Hitler, as old Musso's girlfriend Clara Petacci was a babe and I can't picture George with any babes eating anything bolognese. While we were seeking Bushitlerburton guidance at the Guardian, we came across this nugget. It's industrial strength stupid. I'm talking worthy of enshrinement on the Mount Rushmore of Moronic Observations. It is profoundly dumb, which is hard to do. There's really no point in reading the whole thing. You can if you want, but like many such things, you get the idea of everything that goes throught the mind of such a person from the snippet, which appears to be lonely and pointless trip, and now you can ignore everything else he ever says forevermore. IT TAKES a lot to produce gasps of astonishment from British politicians. But that was what greeted Alistair Darling, the chancellor of the exchequer, when he told parliament on November 20th that two computer discs containing the personal details of 25m British individuals and 7m families had gone missing. The discs were being sent by internal mail between two government departments; they included names, addresses, bank-account details, dates of birth and names of spouses and children. The fate of the discs is unknown, but they contain just the sort of information sought after by identity thieves, who could use it to procure fake documents, commit fraud and empty bank accounts. Here's an interesting fact: the junior official who burnt all that benefit data onto those two infamous CDs was born when the Data Protection Act came into force in Britain - 1984. If the Tory government then in power had had its wits about it, by the time he or she got to secondary school (in 1995, just as the internet was taking off), the computing curriculum would have been compulsory and included something about the importance of data protection and security. "Security" isn't something that Microsoft just discovered with Windows Vista. It has been at the core of the Unix operating system and its siblings for decades. This guy's good. There is no goat he could not scape. A pro. And the "1984" date is pure gravy, Eric Blair-wise. Hey, this is fun. Let me try. Remember, Bush is Hitler. The Guardian told me so. Bush was born in 1946. Harry Truman was President in 1946. I've looked into it, and besides being responsible for the birth of Hitler 2.0, Harry S. Truman was shockingly deficient in implementing Unix security too. 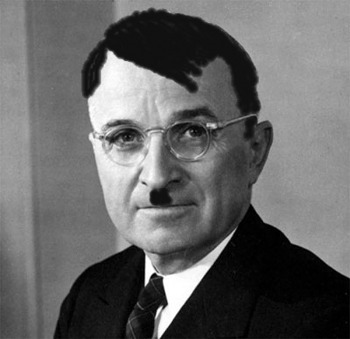 Harry S. Truman. Worst. President. Evar. Ah, the Brit left is much the same, then. They put their energy into making complaints entertaining rather than sensible. What, Roger... you are surprised by idiocy. It has many flavors and tastes. Difficult for me to lodge it against any one political belief nowadays. Perhaps a bad analogy as well, as the appendix was recently given a new lease on life. I'm sure you have read the news. As to the subject at hand... I happen to think that anyone on the public dole should have their name in print... in the daily news, much as drunks and other assorted reprobates. Let us introduce the concept of shame back into the national politic. I will, of course, make exception for those truly in need of such... which is an entirely different subject, I realize. "Security" isn't something that Microsoft just discovered with Windows Vista. It has been at the core of the Unix operating system and its siblings for decades. Unix still doesn't have Security at it's core--not the way they mean. Well, maybe within the last 3-4 years. Clara Petacci a babe? i think she looks sorta lifeless. Damn Buddy... harsh. Though not without reason. right--Clara probably deserves a smidge of sympathy. not old Benno tho.